At this time last year chimpanzees rarely, if ever, crossed my mind. Sure, as a child it was easy to be fascinated by our closest relatives- their power, beauty, intelligence, personality- similar to us in so many ways. But in my imagination, also distant from us- living outside in forests and jungles, not under a roof here in the desert Southwest. Those separate worlds I built in my head collided almost nine months ago, when I was introduced to a population of chimpanzees currently living in a medical testing laboratory in Alamogordo, NM. Since that day I’ve spent many hours getting to know these chimpanzees through scribbled lab notes, medical history charts, scientific studies, articles, op-eds and personal stories. I’ve met passionate chimpanzee advocates from many walks of life, and grown closer than I ever thought possible to a group of chimpanzees who live just a few hours’ drive from my house. 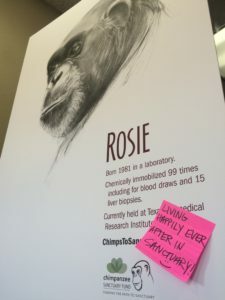 Some months ago, I purchased a Chimp Freedom Tag in memory of Grumpy, a chimpanzee who died in the Alamogordo lab after decades of being used in invasive medical testing. Each time I see his tag, I feel Grumpy too. Grumpy that I was unaware of the suffering he endured here in my home state. Grumpy that he was forced to undergo years of experiments, never knowing what it was like to live with choice and freedom. Grumpy that even though invasive testing on chimpanzees has ceased, there are still hundreds of chimpanzees being held in US laboratories- 139 in New Mexico. In over a decade of non-profit advocacy, I’ve rarely seen this kind of monumental movement. For the first time in US history, an entire species has been protected from use in medical testing. Now, with the release of the NIH plan to move all government owned and government-supported chimps to sanctuary, we will see the last remaining survivors permanently retired, forever closing this sad chapter in our history. For those of you who have given resources to support these chimps- thank you so much. Your gift has made a real impact for individuals like Opal who we’ve helped out of the lab with grants from the Chimp Fund. For those who have not yet given, please consider taking part in this historic last push to get the survivors to sanctuary. If you cannot donate, like our page on FB, share this information with your friends and family. Let’s see this all the way to the end- for Grumpy- and for the hundreds of chimpanzees still in laboratories. Join us in making sure they have a chance to spend the last years of their lives with the peace and dignity they’ve always deserved.